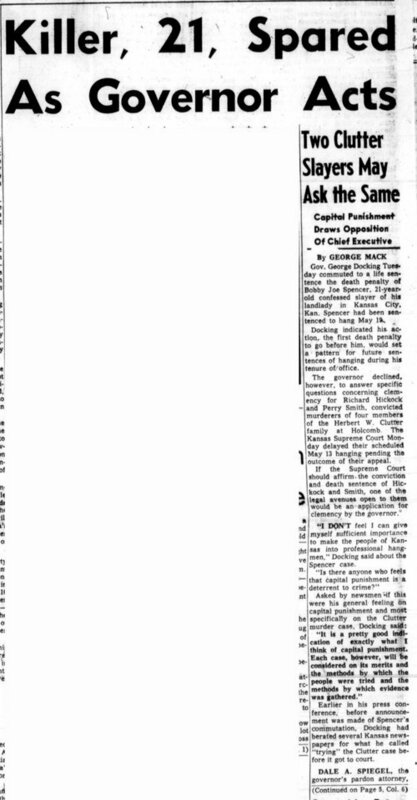 A Topeka State Journal article reports on Governor George Docking's opposition to capital punishment. Docking commuted the death sentence of Bobby Joe Spencer to life in prison. Spencer was sentenced to death by the Wyandotte County District Court for killing his landlady. The Governor's strong opposition to capital punishment partly explains the eight year hiatus on state-sponsored executions in Kansas between 1954-1962.